Back in my childhood we used to have a pomegranate tree in our backyard. When they ripened I remember collecting one at a time off the tree and eating them. I can’t really describe the taste but I remember liking the taste and the texture of the ripe fruit is quite interesting too. It must have been way back because the pomegranate tree got ripped out to make way for a sandpit. 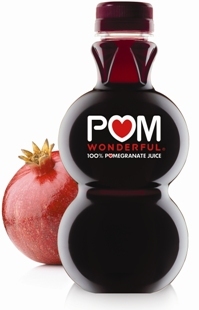 Fast forward 30 years or so and I received an email via this blog to try out some pomegranate juice, POM Wonderful. Sure I said, I’d love to try some. It is really delicious. My son even likes it and it’s really healthy. It contains quite a few antioxidants so it’s gotta be good. For all its details go to the POM Wonderful website. I’ve drunk it straight, and I’ve put some in soda water because I like bubbles and I like red bubbles and these ones are healthy red bubbles. Its available in many Woolworths and Safeway shops in Australia. The US website has a list of retailers. If you get a chance I’d definitely recommend trying some. 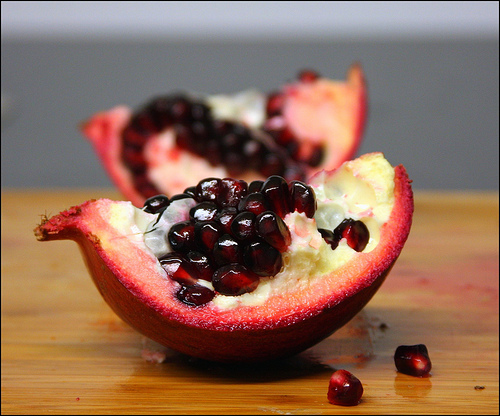 I love pomegranites! I have been drinking the juice this summer although I haven’t tried that brand, I must check it out. The colour is amazing though isn’t it? Joh, I haven’t seen any other brands but then it’s not really been on my radar.